Gail Tverberg’s analysis of some of the underlying causes of the current Egyptian crisis is cogent, but one of the other consequences caught my attention today. For, as was noted in Forbes:While most equity-related assets got battered, a select group of stocks, oil shippers, were corking champagne bottles. Apart from Overseas Shipholding, Frontline Ltd. had a killer day, gaining 7.8% or $1.96 to $27.10. 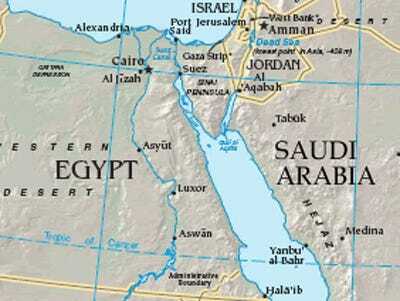 Almost 35,000 ships transited the Suez Canal in 2009, of which about 10 per cent were petroleum tankers. 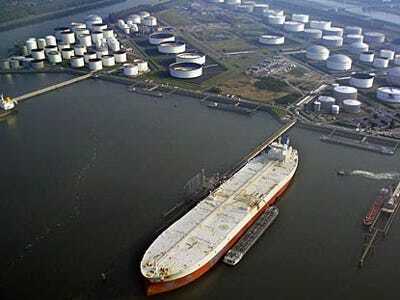 With only 1,000 feet at its narrowest point, the Canal is unable to handle the VLCC (Very Large Crude Carriers) and ULCC (Ultra Large Crude Carriers) class crude oil tankers. The Suez Canal Authority is continuing enhancement and enlargement projects on the canal, and extended the depth to 66 ft in 2010 to allow over 60 per cent of all tankers to use the Canal. One of the more modern ones is fitted to carry either oil or liquefied gas. But before I go on, I now need to define deadweight (DWT). It is not the weight of the empty tanker, but rather the weight of the cargo and fuel that the ship carries. In other words almost everything but the weight of the ship (which, just to be confusing, is known as the lightweight). Put them both together and you get the displacement of the vessel. 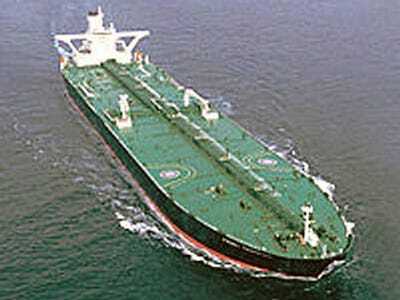 So, that a tanker with a 50,000 ton DWT, with 6.3 barrels to the ton, would carry 315,000 barrels of oil. Now this is not all cargo since perhaps 5% of that total would be the fuel oil to drive the ship, which in this case would be around 15,000 bbl, giving a capacity of around 300,000 bbl. The density of the oil varies, and I used a value from one of the shipping companies, rather than the 7.3 value I have used in the past when converting shipped product. The next significant size category up are known as Aframax, and for a long while I thought that this related to some African capability. However it actually refers to the Average Freight Rate Assessment (AFRA) for the classification. 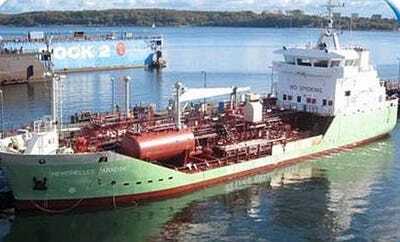 A typical tanker will have DWT range from 80,000 to 120,000 tons (i.e. 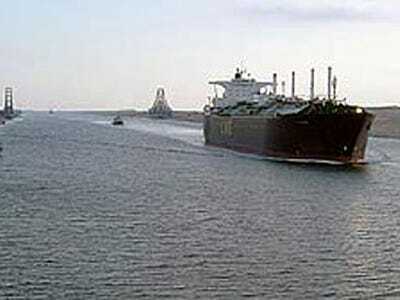 typically a useful cargo of around 690,000 bbl), a draft of 49 ft and a length of 820 ft. 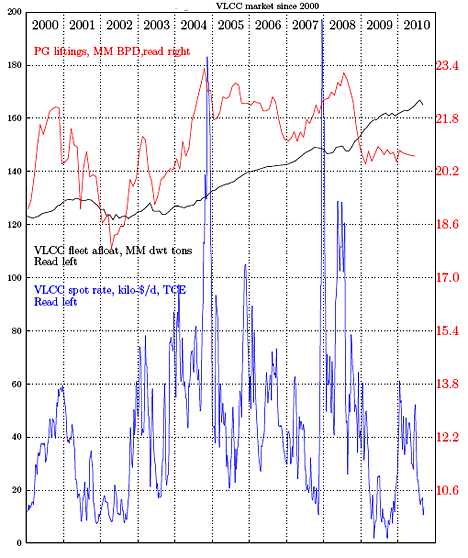 It has a typical speed of 14.7 knots. For those interested, Venezuela just bought 10 of these for $70 million each from Russia. Lloyds see a continuing oversupply of this category, to the point that (until this weekend) they projected rental costs of $10,000 a day or less, below operating costs. However there is a current hope in the industry that the rates may now rise (hence the champagne).The next category will be the Suezmax category which has the restrictions that I mentioned above. They range up to 160,000 tons DWT. Tanker in the Suez Canal. 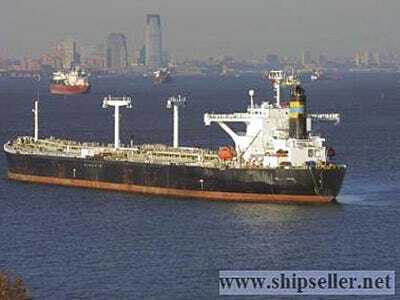 There is one other way of shipping oil through Egypt and that is to put some of the liquid in a Suezmax vessel to transship the canal, and send the surplus up through the Suez-Mediterranean pipeline. With the enlargement of the canal this option is less favoured, and the EIA note that volume in the pipeline dropped from 2.3 mbd in 2007 to 1.1 mbd in 2009. As of 2010, only 12 tankers above 320,000 dwt remain. Of this, only two “true” ULCC of around 430,000 dwt are left in operation, the TI Europe and the TI Oceana, which were part of a group of four ships constructed between 2002 and 2003. The other two ships, TI Africa and TI Asia were converted into floating storage and mooring units in 2010.. The vessel TI Europe was built in 2002. It is 1,246 ft long, it is 223 ft wide and has a draught of 80 ft. It can carry 3.2 mb of oil. (DWT 441,893 tons.) The optimal speed of TI Europe is 16.5 knots laden and 17.5 knots in ballast.